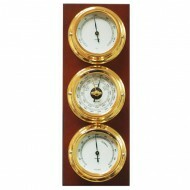 Gold plated weather station comprising of barometer, thermometer and hygrometer mounted on vertical wooden plinth Plinth size: 230mm high x 85mm wide. 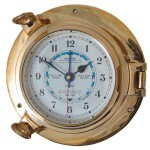 Instrument specification: Base: 72 mm Dial: 50 mm Height: 39 mm Case finish: 24 karat Gold plated Base Material: Brass .. 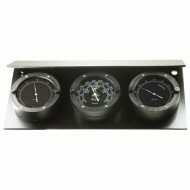 The Baltic Weather station comprise three polyamide cased instruments (Barometer, thermometer and hygrometer) mounted on a weather shielded Aluminium plinth. 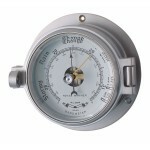 These instruments are suitable for siting both indoors and outdoors. 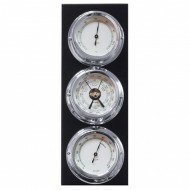 Instrument dimensions are: Base: 110 mm Dial: 100 mm Height: 40mm ..
Chrome plated weather station comprising of barometer, thermometer and hygrometer mounted on vertical wooden plinth Plinth size: 230mm high x 85mm wide. 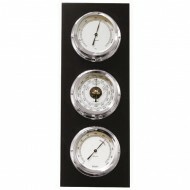 Instrument specification: Base: 72 mm Dial: 50 mm Height: 39 mm Case finish: Chrome plated Base Material: Brass ..
Stoved black weather station comprising of barometer, thermometer and hygrometer mounted on horizontal aluminium plinth Plinth size: 240mm high x 120mm wide. 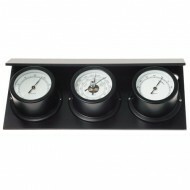 Instrument specification: Base: 72 mm Dial: 50 mm Height: 39 mm Case finish: Stoved Black Base Material: Aluminium This weather sta..
Gold plated weather station comprising of clock and thermometer mounted on vertical wooden plinth Plinth size: 240mm high x 130mm wide. 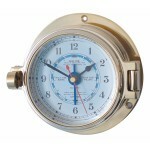 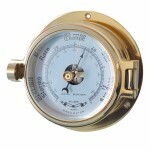 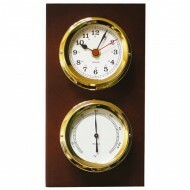 Instrument specification: Base: 95 mm Dial: 70 mm Height: 35 mm Case finish: 24 karat Gold plated Base Material: Brass ..
Chrome plated weather station comprising of barometer, thermometer and hygrometer mounted on vertical wooden plinth Plinth size: 350mm high x 130mm wide. 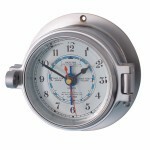 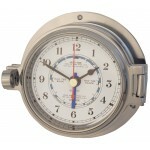 Instrument specification: Base: 95 mm Dial: 70 mm Height: 35 mm Case finish: Chrome plated Base Material: Brass ..